Pretty much every serious political commentator had predicted days, may be even weeks of manoeuvring, right up until last night’s exit poll. Very quickly – and very eloquently – some journalists turned to analyse the unexpected. In the Guardian online Rafael Behr coolly analysed the scale of the catastrophe that had befallen Labour which extended far beyond Miliband’s difficulty in performing with easy aplomb in front of a camera. In The Independent, meanwhile, Rosie Millard reflected on a ‘brutal’ night resulting in an SNP ‘tsunami’ and the Liberal Democrat’s destruction. By Friday lunchtime the online editions of all the major titles were straining to adequately cover the continuing fallout from what the Daily Mail accurately described as an incredible night of political drama. Balls was out, Clegg had quit, and Farage had failed in South Thanet. Then Miliband was gone and Cameron – enjoying his ‘sweetest victory’ – was on his way to see the Queen. 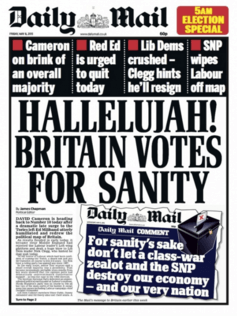 The Daily Mail was erupting with schadenfruede and triumphalism. Cameron was ‘home’ whilst it was the: End of the road for Red Ed: Labour leader admits defeat and quits after leading party to disastrous result. This was sweet victory for the Mail and the Sun who will undoubtedly and repeatedly tell us that it was their influence behind Conservative success. And this is very bad news for those who us who are appalled by the character assassinations endured by Ed Milband at the hands of the Tory press. Cameron’s victory will embolden these titles to resort to such tactics again. The Sun will claim this victory as its own and the sadly iconic image of Miliband eating a bacon sandwich will be as much a feature of future election coverage as the Neil Kinnock ‘light bulb’ image of 1992. Indeed, for seasoned critics of the Sun and Mail, the vindictive lies and slurs directed at Ed Miliband during the final week of campaigning represented another occasion for them to lament ‘a new low’. After the wet bank holiday Monday and the two day diversion of the royal baby, Wednesday saw the gloves well and truly off as far as the right wing press were concerned. Damning Miliband with porcine satire seems – like the Daily Mail’s exposé of his “Britain-hating” Jewish émigré father – to radiate some nasty connotations. Aside from the impressionistic , research conducted by the Media Standards Trust found that the Sun had gone after Miliband in a more ferocious manner than it went after Neil Kinnock in 1992. In its analysis of leader columns from 26 March to 3 May this year their research found that 95% of the leader columns in the paper were anti – Labour compared with 79% in 1992. Over the whole the period the trust examined, the Sun ran 102 leader articles considered to be anti-Labour compared with just four that were critical of the Conservatives. Similarly, Loughborough University’s Communication Research Centre found that across the press, over the whole of the campaign, Labour experienced ‘extensive negative coverage’. That we have such a Conservative (and conservative) newspaper industry is not news. But it doesn’t harm to be reminded of that fact now and gain. As Dominic Ponsford and William Turvill said in the Press Gazette, in this election the UK daily newspaper market backed the Tories over Labour by a margin of five to one. 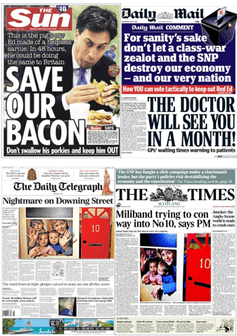 In terms of the Sundays, five out the eleven main newspapers backed the Tories working out at 66% of all the titles. So Cameron is back in Downing Street and Ed Miliband, the would be scourge of Murdoch and the only party leader in generations to openly challenge the press barons, finds his career (for the time being) in tatters. And, whether or not we believe that newspapers influence their readers we are unlikely to see his successor behave anywhere near as pugnaciously. It’s my guess that the analysts and advisors to the new leader will point to the sustained and coordinated negative coverage that Miliband has received and reason that therein lies part of the reason for his failure. It won’t at all matter if evidence doesn’t support that theory. A version of this post appears here in the Conversation. ← Scottish Sun supports Scottish Nationalists: It’s no shock.